I’ve tried making pandesal few times before and failed (ugh) but after many kilograms of bread flour, I finally found the recipe that works for me (with a little tweaking). There is still room for improvement with this recipe of course but so far, for now, this is working for us.. we like it a lot! The recipe below only makes a dozen or more; I like to make small quantities when baking or cooking, just enough to finish in a day..left-overs are no good for me because I tend to forget it. Another reason is to share a recipe that those new to baking won’t be intimated to try.. that has been a problem to me before (and still is, sometimes), I get overwhelmed by the amount of ingredients; I’m aware that if I fail, it will all go to waste. serve with coffee or hot chocolate..yum!! Mix ingredients together, knead, knead , knead the dough then let it rise for about an hour or until double in sze.. Combine warm milk, salt, sugar, oil in a measuring cup or bowl pour over bread flour; mix and turn dough to floured work surface. Knead for about 8 minutes by hand, form dough into a ball and put in a greased bowl; cover and let rise for about an hour in a warm place. Punch risen dough down and flatten into a rectangle about 16x3 inches. Starting at one end, roll up the dough with the right hand while sealing with the left hand to form cylindrical strip of dough. Sprinkle top of dough with breadcrumbs; let rest for about 15-20 minutes. Cut dough into 12-14 equal pieces; place in baking sheets and let it rise until light. Preheat oven to 350 F degrees. Bake pan de sal for about 15 minutes or until top is browned. Serve warm with hot coffee or hot chocolate. 12 Responses to "Pan de Sal (Salted Breakfast Buns)"
Yes, if you really cannot find bread flour. Bread flour is stronger and yields better dough. Where did your yeast go? 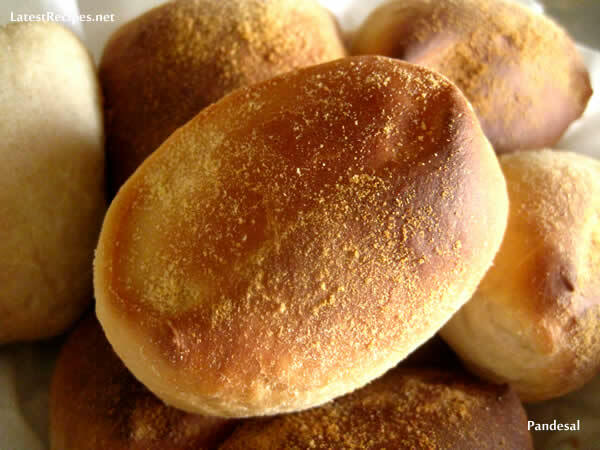 I remember this kind of pandesal in Sagay, Negros Occidental… I love dipping them in my coffee before i take a bite…thanks for the recipe! Sorry to hear about that..happened to me too many times before. I think the problem is with the kneading; try kneading the dough by hand and for a longer time, it should feel soft and not sticky..try watching this video:http://www.latestrecipes.net/2010/10/13/how-to-make-pizza-dough-video/ to give you an idea. And oh, when you roll it into a cylinder, gently stretch it as you fold..you should have almost doubled the length of the dough at the end. I’m not an expert at bread making but I hope that I was able to help you with these tips. The pan de sal looks great. Looks delicious, I love the way you just cut up the dough and bake it without reshaping..:) you have a nice day too!